In a tennis match, almost half the points that you play on the court start with your own serve. 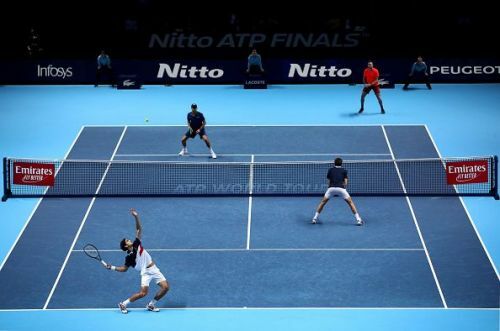 The serve is arguably the single most powerful weapon a tennis player has in their arsenal. The bare basics include keeping your hands about your racket width apart, tossing the ball, bending the knees, springing up and making the desired contact with the ball. However, each of these actions can create so much diversity in what happens once the ball is past contact that it will constantly (or ideally should) keep your opponent guessing. The stance, toss height and bending of the knees are primarily dictated by understanding your body dynamics, and what works best for getting the desired angles with a respectable amount of speed. In this article, let us talk in detail about the point of contact and how your grip and action can introduce a wealth of tactical options while serving. 1) Flat serve: When you want to rip one past the opponent or are simply on tilt, this is the serve you need. It's definitely a crowd favourite, but it's the most challenging to keep in. The tall (above 6'5") players generally have powerful flat serves. 2) Slice serve: This is the serve that comes most naturally. The slice serve is an effective weapon for opening up the court and finding the angles. It is especially helpful for the serve and volley tactic. Roger Federer's incredible precision with the slice serve comes to mind here; it allows him to find superb angles and put opponents way out of position. 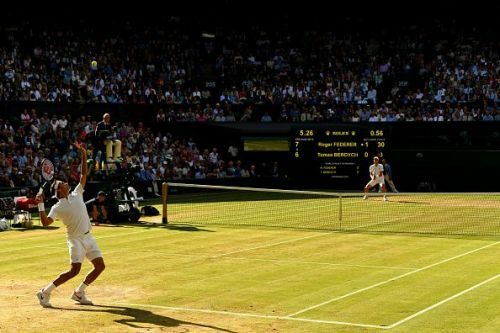 3) Kick serve: There comes a time to play the percentage game. The kick serve might be have a steep learning curve, but when it comes to consistency, nothing can beat it. It's no wonder that almost ever serious player has the kick serve as their second serve. New players such as Dominic Thiem have exaggerated kick serve motions which create some interesting outcomes - especially on clay, where the ball digs into the ground. Let's dig a bit deeper into each kind of serve. Firstly, all three serves can be done with the continental grip, also known as 'service grip' or 'chopper'. Since the objective of the flat serve is to hit the ball dead centre and with little to no spin, the toss of the ball has to be a bit forward, or you have to try and get behind the ball to get a good strike. The flat serve specialists are normally the taller players who have a better angle to hit down on the court. 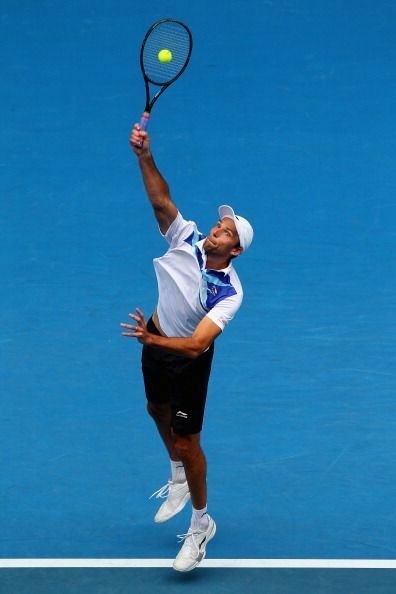 Ivo Karlovic, Nick Kygrios, Tomas Berdych and John Isner, to name a few, have extremely powerful flat serves worth studying. Some players such as Kygrios go a step further (quite literally) by mobilizing the right foot along with the knee bend to build some deadly power. The flat serve can be a killer weapon, but even the best players like to keep a high margin of error. Keep doing this on your first serve, and very soon the aggressor will become the defender. Use it wisely, however, and it keeps the opponent guessing and gives you an added play when the right time presents itself. The fast serve means that if there is a good returner at the other end, he/she just has to block the ball with the racket and it will come back at the same speed. This, along with the heaviness of the action, can become a huge burden. If you are down 15-40 in your service game, mentally you might want to blaze an ace right past your opponent. But going for a powerful slice serve or even a kick serve will give you a much better chance of working your way through the point while starting on the offensive. Now turn the tables and imagine you're 40-15 up. It would make complete sense then to push for a high risk-high reward shot. But what about at 30-30, when the tension is slowly building up? The expectation would be to be more passive, but an occasional strong flat serve could rattle the entire flow/rhythm and create an opportunity to go ahead.